Van rentals, convertibles, luxury cars, SUVs and sports cars are some of the most popular & highly rented categories at the John Wayne Airport. Rent a car for John Wayne Airport in just three quick steps - search, compare, reserve! Cancel your John Wayne Airport car rental for free, up to 48 hours before the pickup time. With our John Wayne Airport (SNA) car rental, you can enjoy comfortable and hassle-free commuting to or from the airport. Our company makes rental service the most cost-effective and comfortable way of commuting. We serve both business and leisure travelers seeking budget and comfort based John Wayne Airport car rental. Select from a wide fleet of cars. We offer low priced rental deals with all inclusive benefits like collision damage waiver, liability insurance, unlimited mileage, roadside assistance, road fund tax, airport tax, and several pick up and drop off John Wayne Airport car hire locations. The John Wayne International Airport is located in Orange County, California. It is surrounded by four cities: Santa Ana and Costa Mesa to the north, Irvine to the south and east, and Newport Beach to the west. Originally called the Orange County Airport, it was renamed the John Wayne Airport, after the actor, who lived in Newport Beach until his death in 1979. Well over 9 million passengers travel through the John Wayne Airport annually, and it is easy to locate facilities for John Wayne Airport car rental, which makes it perfect for you to procure vehicle, while you are visiting the area. This airport is only 14 miles from the Disneyland Resort, which makes it very easy to visit the “Happiest Place on Earth”. A nine foot statue of John Wayne, called “The Duke”, is available for viewing in the Thomas F. Riley Terminal. The statue is made out of bronze, and was dedicated to Orange County on November 11, 1982 by its creator, the Hoka Hey foundry, located in Dublin, Texas. Many great amenities are available at the John Wayne Airport, which makes it passenger friendly. Additionally, this airport continues to grow and improve, since it is constantly evolving. If you need to go straight to your accommodations from the airport, you can obtain your John Wayne Airport car hire service from us easily enough, soon after your flight touches down. You can shop for luxury hoods, books and chocolates when in this Airport. John Wayne airport provides a free internet access to all its travelers. Formed by an art commission, the art corner here displays fine work.. 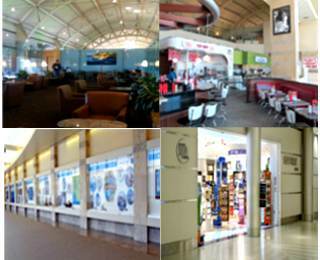 This airport has a plethora of eateries throughout its premises. SNA airport houses two lounges for the comfort of its passengers.